rose hips frost, originally uploaded by ebbandflo_pomomama. 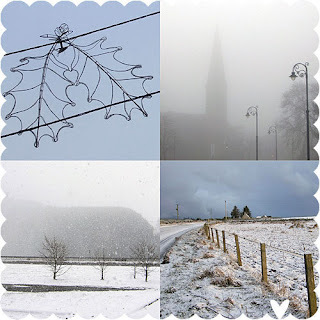 A year ago we were combating jet lag to enjoy a good old scottish festive season. 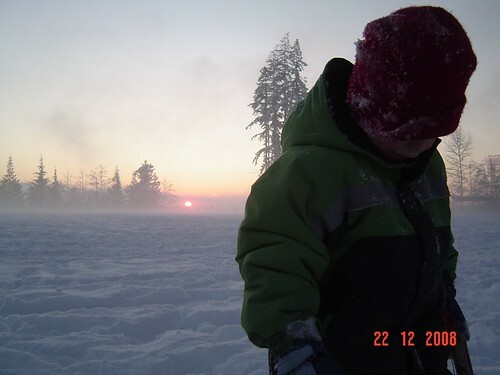 I was dismayed at the levels of hoar frost considered normal and also at how short the days were but enjoying being with my family for Christmas for the first time in over a decade. This year we're all but snowed in as Lower Mainland enjoys (?) record snow accumulation .... but we don't have to go anywhere so life is generally relaxed right now. 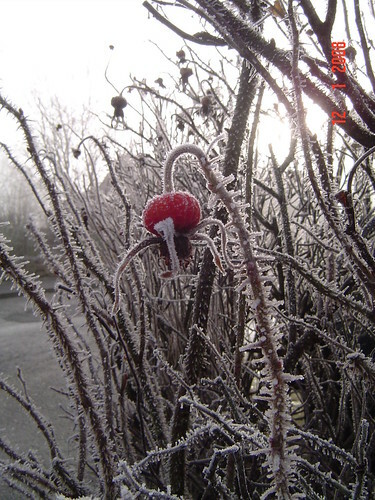 This is one of the photographs I took last year (just over a week before I went deaf ... but that's another story) of some rose hips caught by a sudden overnight frost. 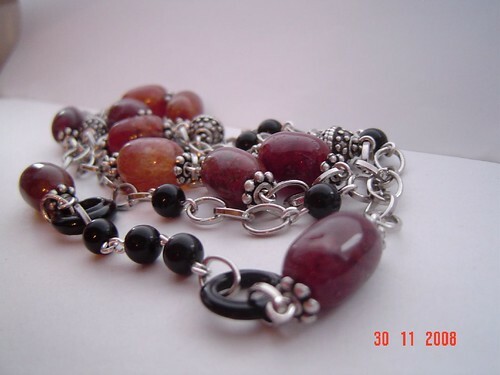 I eventually got around to making a necklace inspired by the red berries by the next winter. I guess I'll be listing it soon in my new artfire studio so stay tuned! late evening toboggan run, originally uploaded by ebbandflo_pomomama. wishing you all a very merry christmas and all the very best for the new year. it just got snowier, originally uploaded by ebbandflo_pomomama. .... we did make it home on Friday. It took 10 hours to reach home, which is longer than it takes to fly back to Scotland, and we arrived to find the place covered in that fluffy white stuff we now know is snow. It turns out that our advanced driving course along the snow-pack of the BC interior was good preparation for the nasties around the Tri Cities since it has done nothing but snow heavily since we got back. 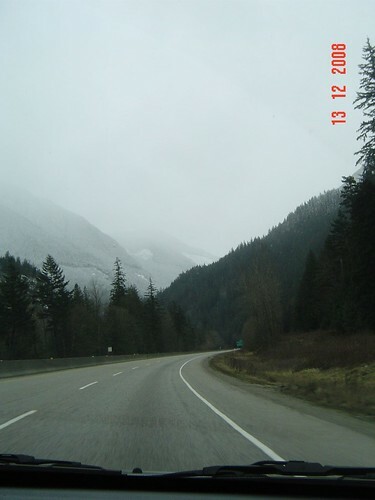 A quiet word to the drivers of Lower Mainland - STOP DRIVING LIKE NUTTERS WHEN THERE IS SNOW AND ICE AROUND. mr ebb made it into work on Monday. I only just made it down the mountain to a chiro appointment. Grocery shopping on Tuesday was essential. Christmas Eve has been completely snowed off but all I ran out of was wrapping paper. Tomorrow we don't have to be anywhere but home. I think we'll survive. unfeasible ski feat, originally uploaded by ebbandflo_pomomama. With our holiday almost over, mr ebb and I are already planning the next getaway. 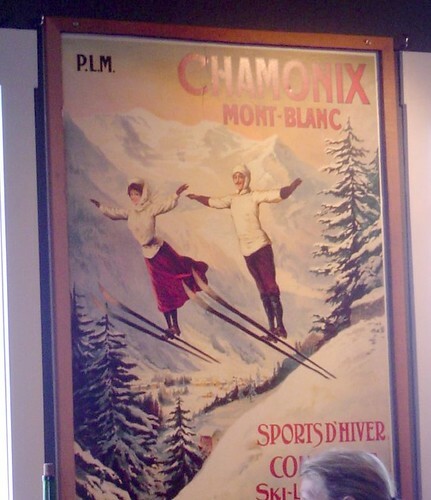 We're thinking of a costumed re-enactment of a ski tragedy in Chamonix as pictured in this period poster extolling the virtues of fresh air and sensible exercise suitably clad. With a corset that tight I doubt if the lady pictured has even enough breath to launch, let alone get to the top of the piste. And don't get me started on the skinny wooden skis, voluminous skirt and free heels assembly (or maybe she just parachutes down to land?). Both look like they've had their bottom jaws bandaged tight shut to stifle the protest before they were pushed off down the launch pad. Gee those crazy victorians! Anyway, it was the last day of our holiday. The Wee Guy got to the top of the mountain on the white knuckle chairlift ride of doom aka the Comet and made it down safely for hot chocolate at the kids' ski hut (thank you Roland! i'll forgive you now for teaching the wee guy that kissing is sissy - we've had an entire evening of discussion about whether that activity is cool or not, who he should kiss and whether kissing girls is yucky or not!) while mr ebb and I got steeper and deeper among the trees off the Alpine Meadows chair. whew! run on sentence much? oh geez how i hate that term, it makes me feel old and un-rad and v un-gnarly cos i don't go with the lingo (backside 880 aubergine twist front grab anyone?). but this is me on my snowboarding carving down Whisky Jacks at Silver Star. we spent the morning playing around off the Comet Chair where the snow was fresh and the sun warm (only a balmy -24C today folks!). ..... and the faint squeaking noise in the background is either the Comet chair lift or mr ebb's brain, not my knees! Today's extremely low crotch competition was won by the young dude coming off the Comet Chair in the yellow pants, with the waist band slung nonchalantly mid thigh and crotch at knee level. Darling undies dearie - were you by any chance the young buck who was mooning everyone in the bakery yesterday evening with the sub-hipster designer jeans over jet black thermal long johns? Fashion note - low slung never looks good on stick thin BTW, there isn't enough meat to carry it off KWIM? the Stig on vacation, originally uploaded by ebbandflo_pomomama. Day 2 - still bl**dy freezing but skin now nicely leathered so not feeling it as much. The snow here is fantastic which amply makes up for the sub-zero-ness of the pistes. We've now become adept at sealing off all access to our skin from the prevailing winds (wind chill in the minus 30's C today) though my nose did go white with a blob of ice after one whizz run down this morning. There can only be one of The Stig, and I think he's here on vacation with us (or at least a shorter, female, cowl-wearing version of him). Sadly no rad videos of ebb or mr ebb ripping it up, but here's one of Terrific Man aka The Wee Guy ascending. Enjoy! More Silver Star pics in this set. 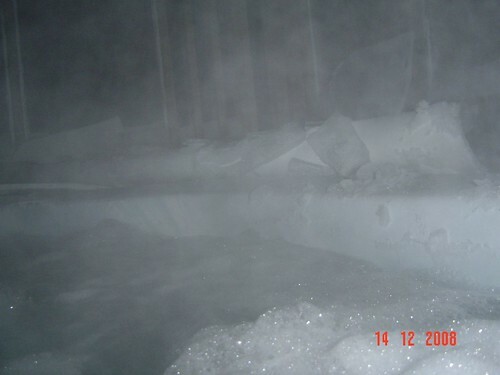 ice around the hot tub, originally uploaded by ebbandflo_pomomama. Oh yes indeed! Running at a cool minus 20C for most of today, extremities were in mortal peril. 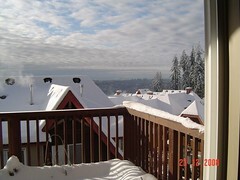 However, the snow here in Silver Star is amazing. The runs are well groomed and I'm having a blast remembering how to snowboard. When I added up how long it has been since I was last on my board I nearly fell off (OK I did have a pretty good wipe out on the first chair lift) - it's been about 3 years since I was last on any of my boards (right - boards. I have a super cute Freedom 51 = ancient freeride board, a little like the Supermodel, a beautiful old asymmetric PJ 4.9 and an awesome Burton Factory Prime). I had a great day out with Mr ebb (the wee guy was in ski school all day!!!) remembering to bend the knees, not handbag with my trailing arm, upweight my turns and even had a go riding switch. Odd facts you might not know about ebbandflo - I have both CASI Basic Level One and level one race coach qualifications! But all in all, it was a freezing day, necessitating buying extra warm layers (not needed since our days of riding in Tremblant) and eating high calorie snacks frequently (sadly not including the fine dining we used to 'come home' to at Auberge la Porte Rouge). 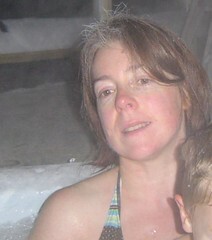 And freezing days on snow must always end up in the hot tub, where I acquired some new grey streaks (ice, not peroxide). leaving Hope, originally uploaded by ebbandflo_pomomama. 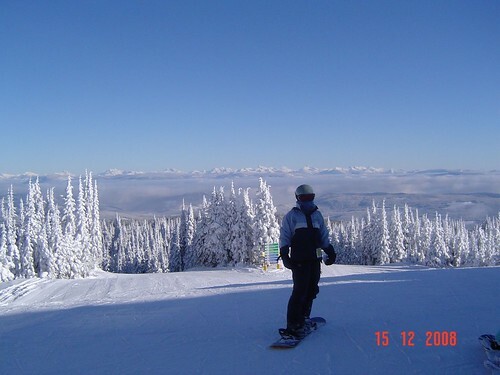 The holiday shipping season is over so we're taking a pre-christmas break in one of BC's interior ski resorts. What should have taken, by DH's estimate, approximately 5 hours found us arriving a staggering nine hours after leaving home. 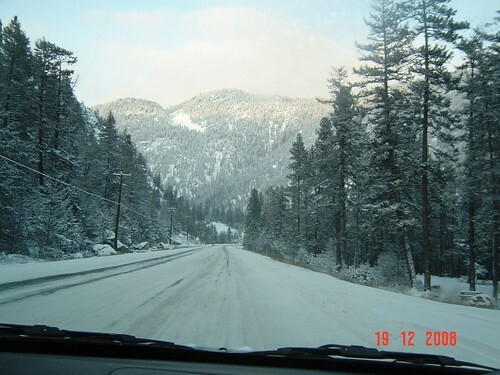 Most of the journey was over packed or drifting snow thru two high mountain passes with the final stretch on ice up to Silver Star from Vernon. At times I didn't believe the car would make it and even now I'm not a great fan of traction control. But we did make it ... and there is wireless internet in the room ..... and The Wee Guy is booked in for a full day of ski school tomorrow! to enable artisans to make a living from their craft? I'm totally amazed at the delusional hallucination that this chap is obviously suffering, Etsy is not facilitating artisans making a living from their work! Etsy is encouraging rock bottom pricing, contributing to the myth of handmade being on par with cheap and moreover is shoehorning sellers into frequent re-listing to stay on top of an inadequate search function. I nearly fell off my chair at the global marketplace analogies having witnessed the struggle to get Etsy to denote all prices are in USD (rather than the ten or more non US-dollar currencies around the world) and been completely gobsmacked at an employee recommending priority worldwide shipping for late purchases from Canadian sellers as an answer (see comments here) to the late timing of promotional efforts onsite (FWIW priority mailing costs more than 6 times the $15 price of an average item on Etsy). Let's not even touch the inability to comprehend different time zones outside of Brooklyn. In addition, this incredible community visualised is not materialising because it is not being fostered. Keep taking the happy tablets! studio time, originally uploaded by ebbandflo_pomomama. 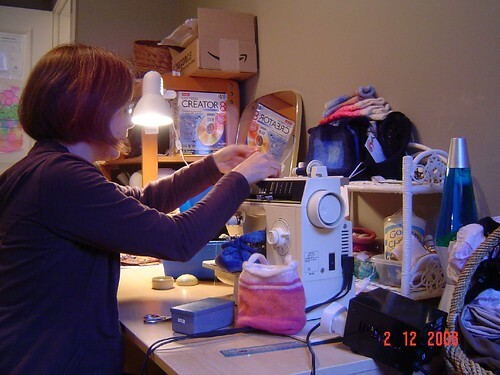 Hard at work threading up the sewing machine. It's been transplanted (like me) from the UK and therefore has to run off a transformer ( wish I had one too!). 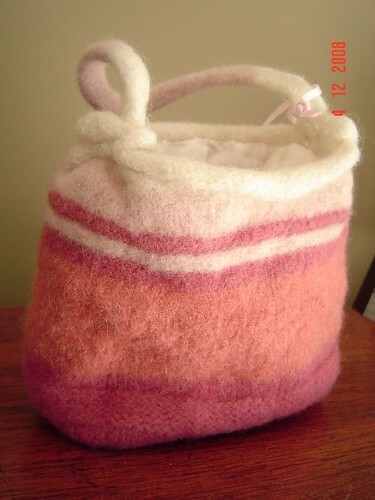 I submitted some of my felted bags for jurying at a local christmas craft boutique and they were accepted so here's me quickly adding linings to the remaining three bags/baskets. Here's one of the bags. It's lined with some scrumptious cream raw silk I found at a local thrift store for 50c. .. and when did that double chin arrive on the scene? oxidised fine silve pendant, originally uploaded by ebbandflo_pomomama. 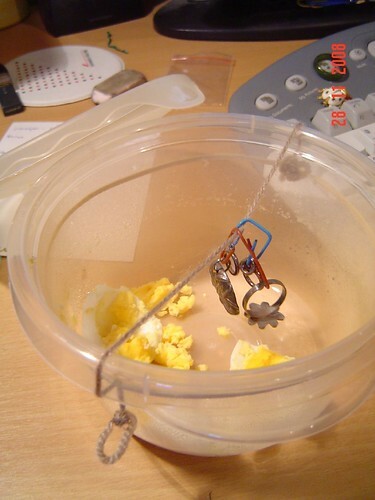 Playing around with fine silver and eggs = great result! will be available at http://gotcraft.ca on sunday! furious fibre felting in progress, originally uploaded by ebbandflo_pomomama. 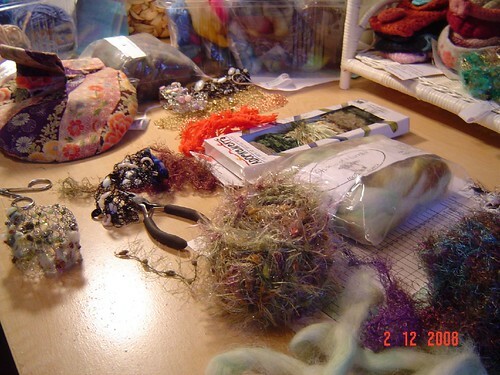 Yesterday's in tray on the desk - a very satisfactory morning of fluff, fibre, felting and embroidery. They'll be on sale at the got craft craft fair on sunday. oxidation in progress, originally uploaded by ebbandflo_pomomama. .... and then it made a great snack! So this week, Monday to Friday, I've been giving a shout out for some sellers taking part in The Tiny Fig's blog giveaway. Here are my final selections, picked for beautiful product photos. Click on each photo to find more. And also one of my own "i'm feeling quite smug about this one" pics - eccentrics cufflinks (square version) now for sale here. ah! if only this were scratch and sniff! Pictures and very few words this morning. My inbox seems to get progressively fuller as the week goes on even though I've been patting myself on the back for being relatively efficient and productive so far! Please click on the pics to get more info about the items, all are from sellers taking part in The Tiny Fig's blog giveaway (you know the score by now, blog and leave a comment here). Meanwhile my desk is covered in silver filings as I polish up a pair of stud earrings ready for soldering later today. I've also got a ring blank waiting for my first piece of art clay soldering on top and I finished another fine silver constellation cuff. BTW if you're wondering where else (apart from Etsy, Artfire, Dawanda and icraft) you can get your hands on ebb and flo goodies then if you're a local shopper check out The Treasure Room at the Arts Council of New Westminster. 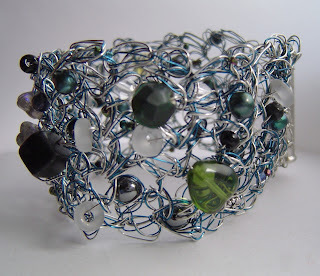 I have a few constellation wire crochet cuffs and some sterling wired cufflinks on sale there from December 1st. Work by other local artisans is also on sale there up until December 23rd so it will be a great place to buy those OOAK gifts for your nearest and dearest. 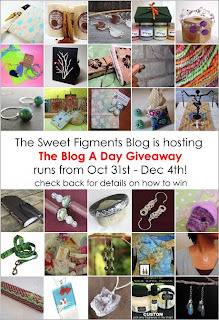 A really quick post today with more on The Tiny Fig blog give away. My first pick today is the awesomely titled askingfortrouble who sells from her own website and is based in Glasgow, Scotland. These beautiful christmas cards immediately caught my eye and also made me a wee bit more homesick than usual! My second quick pick of the day comes from the US. Jilldrapermakesstuff certainly does 'make stuff' but it was this amazing watercolour handdyed and spun yarn which took my eye. I've been bitten by the knitting bug again recently. Seeing such beautiful fibre makes my eyes water and my fingers twitch! Meanwhile, all is busy in my little studio. I finished off a fine silver constellation cuff last night and today polished up some ring blanks for a project this afternoon. I will be selling at Portobello West in Vancouver on Sunday 30th November and again the week after at the Got Craft market on Commercial Drive. I sent out my newsletter announcing these events yesterday with some sneak peeks of what is on offer. If you would like to receive updates on all things ebb and flo (not just the local stuff) then just send me your email by leaving a comment on this post (don't worry, I'll delete the details once I receive your post). As per yesterday I'm blogging about more of the fantastic blog give aways which Tiny Fig is running from her blog (full details here). In order to participate you need to visit the shops listed, blog about them and then leave a comment under the blog give away post at Tiny Fig - easy peasy! First up is organidog's wonderful pet treats. Don't forget your dog at Thanksgiving with these amazing drumstick biscuits. ... and secondly, even though it's miserable wintry weather outside (well it is for me!) how about adorning your earlobes with some enchanting chainmaille flowers by Xiztance. 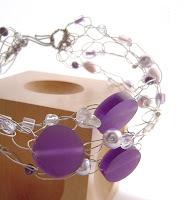 The design is very simple and is in fact one of the patterns I cover in my chainmaille class at Beadworks. Lastly, do you have a man on your christmas gift list? (I'm meaning to buy for, not as a 'please santa, give me a hunky man for christams' cos it's a well known fact that the man in red and white knows that you are going to be naughty with this gift and anyway it won't usually fit down a chimney so give up on the idea anyway). 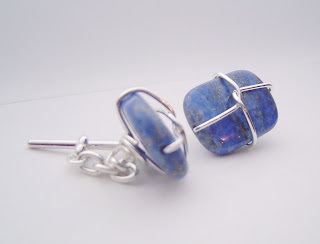 Well I might have an answer to your problem - I listed some cufflinks in my Artfire shop last night - sterling silver wired designs in lapis lazuli, picasso jasper and pressed glass. Go get 'em! attack of the giant fluffy pom poms, originally uploaded by ebbandflo_pomomama. something a little different while i wake up to start my day! 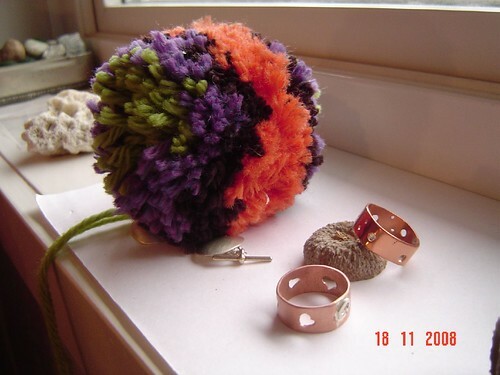 giant fluffy pompom eats sterling silver cufflink and moves in on the copper rings i finally finished off. 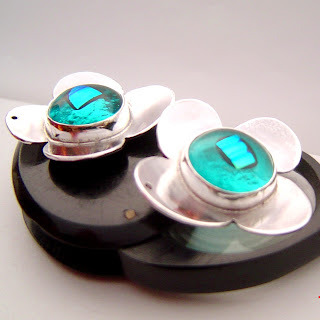 PS: i will be listing more cufflinks in my etsy shop and have already added some custom projects to my new artfire store. OK I've been terribly remiss about blogging recently and also about participating in the Tiny Fig blog giveaway which Connie has been running since the beginning of November. My fellow Vancouverite has rounded up a great selection of give aways from fellow Etsy sellers and conducting a Christmas give away from her blog (full details here). I blogged about it right at the start but then vanished from the blogosphere! 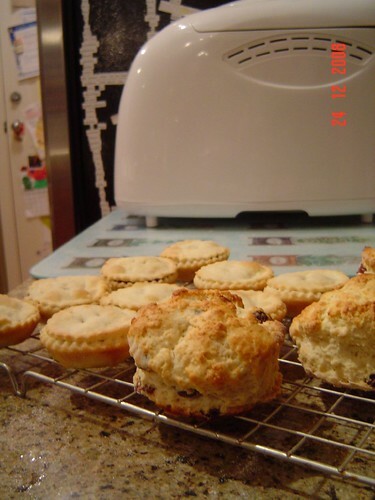 Part of the deal is that I should blog about some of the sellers taking part - so here goes! First up is chendric who makes awesome fine silver jewelry, such as the beautiful fine silver branch earrings shown here. 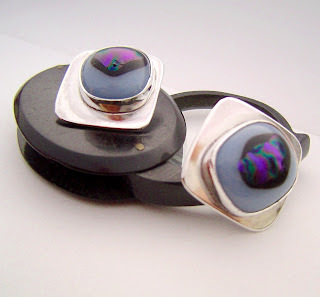 Cheryl works in precious metal clay (PMC) and also beads for some colour in her handwork. She's also a member of Etsy For Animals street team, a very worthwhile cause. 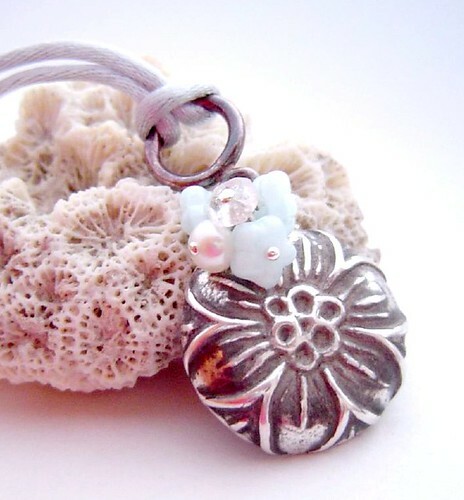 My second choice for today's give away blog is TooAquarius who has the most awesome polymer clay beads available in her shop. This sampler listing immediately caught my eye. Now while anyone can pinch off a bit of fimo and rool it into a bead, I think that these beauties show a really professional touch and deserve to be incorporated into something stunning! 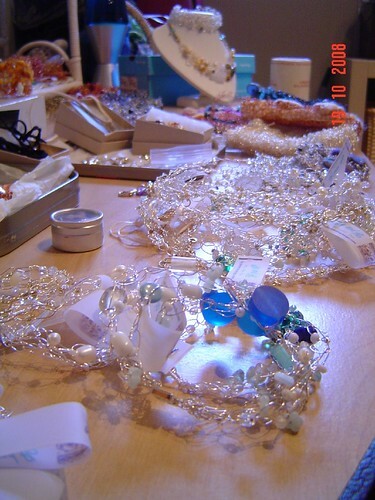 However if you do fancy trying your hand at making a bead, Elaine's canes can be found at her other shop ClayChicks. .... and PS: this is what I'm offering for the blog give away! Go visit some of the featured sellers then leave your comment at the Tiny Fig blog! ... or in translation, what am I doing these days? Well, while my lil' sis was staying I finished setting these adorable glass cabs in sterling daisy mounts ........ but I'm not sure what they will end up being! They are definitely too heavy for earrings unless you have reinforced lobes. I drew the flower outlines freehand then cut the sheet metal (yes, one petal is a little larger and the whole daisy looks very random) shapes out. 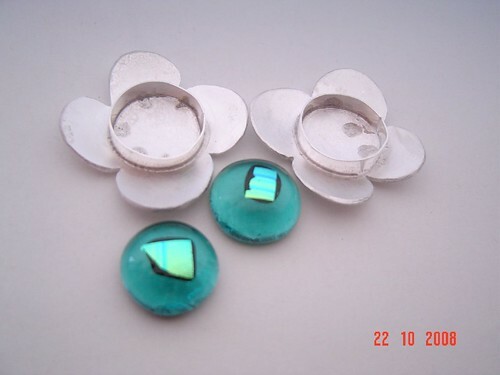 The flowers were then domed slightly before soldering the bezels in place. Setting the cabs was a dream. I also finished up another pair of cufflinks. These are a square version of the circular eccentrics I have for sale in my Big Cartel store. They are just waiting for the sterling toggle bars which I'm hoping Canada Post won't send all the way back whence they came instead of notifying me they were waiting at the PO for me to collect! Now that I've found I can complete the soldering on these at home I'll be making more with the stash of glass cabs I have in stock. ....... and I got blogged (thanks Rob and Andrea)! you will either like this or it will make you faintly sea sick! Finally added the waterproof camera pics to my flickr site! After a lot of logistical planning and deliberating we decided to kayak with me in the rear cockpit of the double, the wee guy in the front cockpit and mr ebb in a single in case of emergency! Since we haven't done a family capsize drill the whole set up is at best theoretical, but we did get afloat and managed a short expedition from Belcarra to Jug Island. Next year the wee guy is going to summer camp and will learn to paddle his own kayak! Respect treasury November 2008, originally uploaded by ebbandflo_pomomama. The "Respect" treasury curated by the always eloquent cynmb and featuring some of the squeakiest wheels which etsy probably wishes would shut the f*** up - in fact at least two of the artists featured have been muted permanently from taking part in the forums, one of the artists was muted for a prolonged period and most of the others have 'flirted' with occasional reprimands from etsy high command (myself included). For a purported 'community' of artists/creative types/ freethinkers i personally find the judicial system on etsy incredibly illogically repressive (and i've worked for/with some real dross in my life too). All the artists featured here have at one time or another (or continue to do so) made critical (but mainly constructive) comments about etsy inc and the way it is run. In the early days the Ideas thread in the forum welcomed feedback from users about how the site was working and what improvements could be made. Nowadays it can feel like shouting into the wind. It is very easy to be frustrated as a user, even three years into 'life'. blog give away - read on! PS: my give away is top right, a mod dots bracelet in purple. freshly picked, originally uploaded by ebbandflo_pomomama. Made these at last night's silversmithing class. They are (in case they are so fugly you can't recognise them) handdrawn and cut daisies (as usual with four petals - i'm not sure if i can draw any other flower) in sterling silver with fine silver bezels (one needs a little more soldering to complete the seam). The centres are these awesomely fresh fused dichroic glass cabs from willowglass which have been waiting in my stash for a cute project. Still not sure - earrings or pendants? Any votes (they are around 2cm diameter for size)? Anyways, stay tuned for the 'after' pics soon. 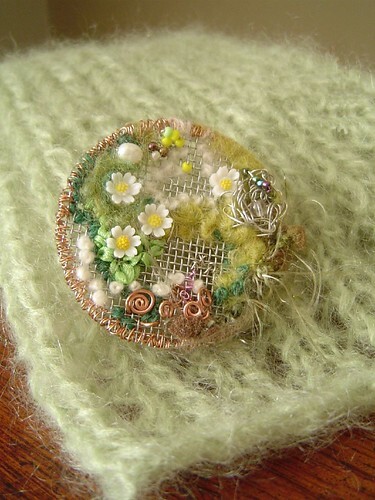 garden brooch with mohair scarf, originally uploaded by ebbandflo_pomomama. 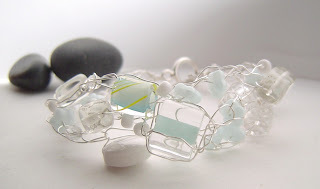 I've just finished adding photos of the wire brooches with the handknit scarves to my flickr gallery. They'll be in all their glory at PortobelloWest this Sunday (12noon to 6pm at teh Rocky Mountaineer Train Station just off Terminal Avenue in Vancouver - free shuttles from Main Street skytrain). Perfect for gift giving - shop early for christmas! heaps of wire crochet, originally uploaded by ebbandflo_pomomama. Yesterday evening I worked thru my inventory in preparation for a craft fair next weekend. I'm trying to get everything ready in advance for a change as I'll be quite busy most evenings this week. I checked all the pieces had price tags and that my displays were up to scratch .... and I added a lint roller to my list (a must have for dark blue table coverings). This morning I packed all my equipment, jewelry, cloths, etc. into a giant pull-along suitaces and voila! ebbandflo is good to go. So this afternoon we (The Wee Guy and I) have a playdate with a neighbour. I'm taking pumpkin bread and himself will be taking along his best smile and funky T shirt to impress the ladies. I'll also be turning up with some knitting. 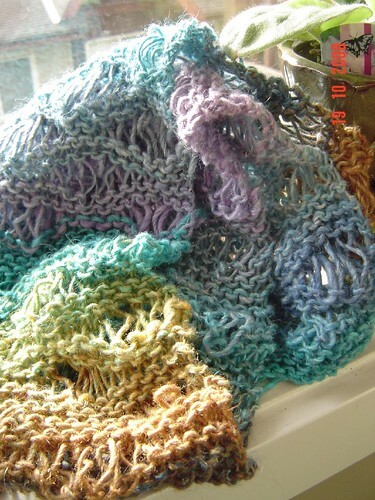 I want finish off this mohair scarf and start on another crochet neckwarmer. I have great plans to display (and possibly sell) my brooches in situ on neckwear at the craft fair ..... and that's about as much marketing and prep as I've done so far! just off the pins, originally uploaded by ebbandflo_pomomama. 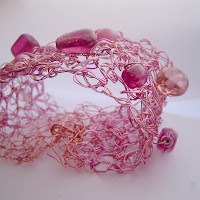 I've not been doing that much jewelry work recently (though I am setting up another batch of ACS leaves - see my portable crafting blog for details) but have been getting heavily into the knitting/crochet world. A new yarn shop, Black Sheep Yarns has opened locally and it is a goldmine of the most incredible yarns, including some from one of my favourite handspinners/dyers, Yummy Yarn. Anyway, Just finished this last night (and oh boy did I stay up late just cos I was getting to the end of the ball) drop stitch scarf in Noro Silk Garden Lite (silk/kid mohair/lamb's wool) on 6mm needles. 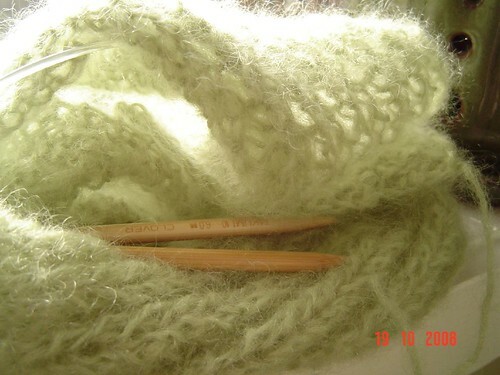 It was a dream to knit up, the pattern is gorgeous and I love the texture formed by the thick/thin ply of the yarn with the drop stitch 'waves'. I am also totally in love with the colours (colour no. 2027 if anyone is interested). I'm going to be pairing this with one of my flotsam or wire crochet brooches. Fallen leaves, originally uploaded by ebbandflo_pomomama. Went for a very wet walk today after dropping off The Wee Guy at school (and cripes! it's nearly time to pick him up again already!). The leaves are really turning on some trees so it's a good time to go pick up some ornamental maple leaves to coat with art clay (ACS) slip. The marg tub lid is smeared with vaseline (!) to keep the leaves in one place (hint: don't get any on the surface you want to coat with ACS slip) and they are placed face down so the nice veiny side is uppermost. They were really wet so while I and they dried out I prepared some slip. Slip is "mistakes rehydrated in a jar" plus scraps so I really do upcycle my work. 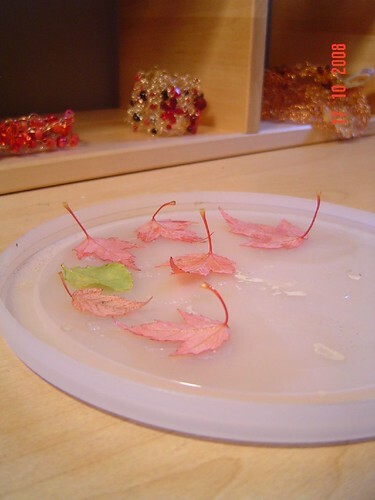 Once the leaves had dried out they were painted with a few coats of thinnish slip, then left to dry at room temperature. I find that if I put them on the candlewarmer they crinkle up, and with a hairdryer they blow away. Slow is definetly better at this early stage. Once coated witha few layers of slip I can relax a bit. They're good to go which means that I can slap on some thicker paste whenever I'm passing. Once about 10 layers or so have been applied and dried then I can fire them. mode of conveyance, originally uploaded by ebbandflo_pomomama. The Wee Guy is very proud of his trailer bike. He gets around all over the place on it. 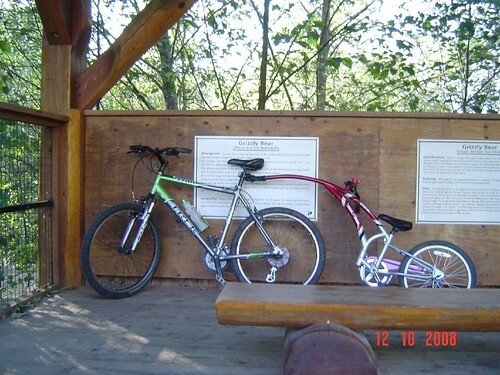 This time we're cycling around the vastness of Greater Vancouver Zoo. It's the best way of traveling around here - walking IMO is far too dull and you're less likely to witness the excitement of being 'buzzed' by the cheetah chasing you! Depsite all the criticism of the place, they really have started working on improvements in signage and animal welfare. When we first visited, about 4 years ago, there was very little signage and the animal enclosures were pitiful. Conditions are slowly improving and I like the extensive nature of many of the habitats. SIgns now tell a little about the residents and, more importantly, their position on the endangered list. The zoo is becoming more educational but still lags a long way behind, for example, the aquarium. Whatever you feelings on zoos are, I think they are a necessary part of conservation these days - and thankfully most are recognising their responsibilities. OK ... so maybe I did rant a little at a blog last month. It was a mummy blog. ... and maybe this was the final straw for the camel's back? But I haven't seen that blog post in a while. Maybe there's a way to remove yourself from someone's Google Reader? .... but I do fell glad that I spoke out about the utter crap that some mummy bloggers seem intent on foisting on the rest of us struggling mums. Honestly! Why try to make us feel any worse that we usually already are by voicing 'concerns' about possibly the only organic food that our children will eat willingly? Snacking carrots are a mainstay in my house. I love it that The Wee Guy will eat them willingly and pack them for his healthy school snack. So maybe I'm just a little touchy about an attack on my dwindling nutritional powers? Life as a mum is difficult at best, there's no real feedback or job appraisal and most of us just Try Our Best. Suddenly mummy bloggers seem to have taken it upon themselves to heap our already piled high plates with a whole host of extra work orders. When was the last time you heard a dad being encouraged to check out the BPA content of a sippy cup, or to tally up the organic-ness of the shopping list? When were dads last encouraged to boost the earth-friendliness of suitable developmental toys, or blasted because their little 'uns weren't in sustainable fibres? Yup - never! As well as running the household, having responsibility for the majority of the housework and childcare, and overseeing feeding the masses, mothers are suddenly expected to also keep the faith as being the social and environmental conscience of the family. In translation, yet another bloody thing to do! and PS: carrots always go slightly white on the surface if you peel, wash and keep them damp. I know that from when my parents used to grow their own veg. ready set tumble, originally uploaded by ebbandflo_pomomama. 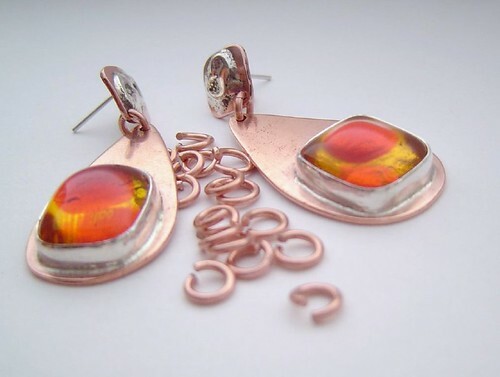 The copper and glass earrings are finally assembled and ready for tumbling. I tumble most finished pieces in stainless steel shot to work harden the metal and bring up a shine after intial polishing. In the case of ear posts it also helps to smooth the ends (all my handcrafted earwires are tumbled to make sure there are no snaggy bits left). I made some copper jumprings for the connection - the surplus is going thru the tumbler too to stabilise them. I make a few extra each time then add them to my stash. Once the earrings are tumbled I'll be adding them to the new Fall jewelry section in my Etsy shop. 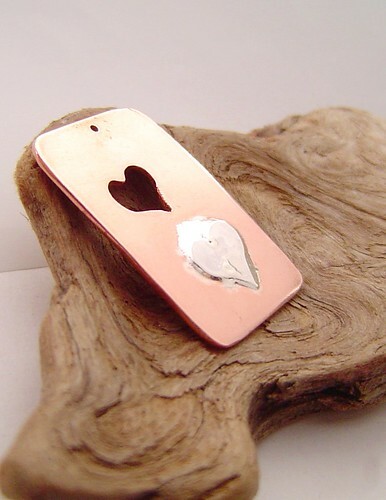 I added this copper pendant this morning. Autumn is here and you need new jewelry! I've started the new Fall section in my Etsy shop and will be listing some great new items for updating your autumn wardrobe. I'll be focusing on copper, either contrasting with hot pinks or lavender or blending it in with warm ambers and citrine. I've been working on some copper wire crochet sets as well as some of my new metalwork pieces. Stay tuned (and don't forget to check the sneak peeks too)! 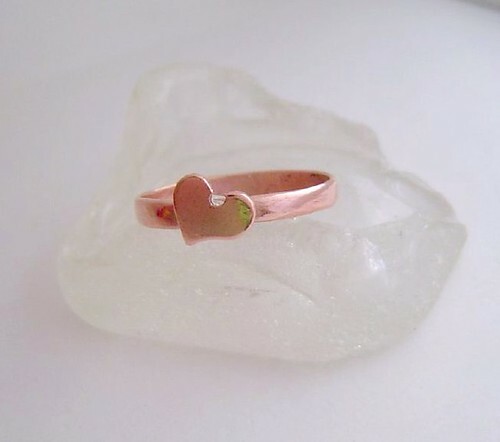 sweetheart copper ring, originally uploaded by ebbandflo_pomomama. Finished this off last night - OK it only needed hammering out but I don't (as yet) have either a steel ring mandrel or a rawhide hammer. My wishlist this year is for a raw hide hammer, a square steel ring mandrel and a round steel ring mandrel.